The Glass Sponge gets its name from their skeleton which is made of six-pointed siliceous spicules, meaning glass-like. The Hydnoceras fossils shown in these photos are one of several thousand species of fossils belonging to the Phylum Porifera (sponges). Sponges are one of the most primitive animals, and as such, lack many of the typical features of animals including nerves and locomotion. Sponges are characterized by a feeding system unique among animals. Poriferans don't have mouths; instead, they have tiny pores in their outer walls through which water is drawn. Cells in the sponge walls filter goodies from the water as the water is pumped through the body and out other larger openings in the sponge. Sponges first appear in Late Precambrian time, about 600 million years ago. Except in a few scattered localities the fossil record of sponges in not abundant. Some fossil sponges have worldwide distribution, while others are restricted to certain areas. 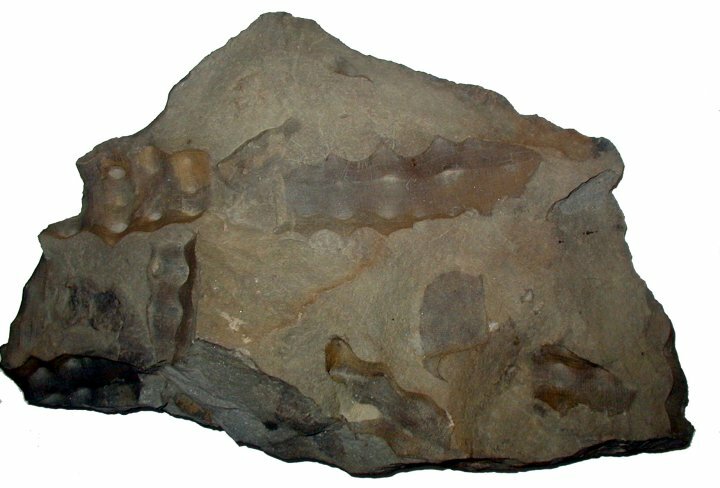 Sponge fossils such as Hydnoceras are found in the Devonian (417-354 million years ago) rocks of New York and West Virginia. Fossil sponges range in size from 0.4 inches (1 cm) to more than 3 feet (1 meter). Sponges vary greatly in shape, being commonly vase-shaped, spherical, saucer-shaped, pear-shaped, leaf-shaped, branching, and irregular or encrusting. The WVGES Museum is fortunate to have these rare and excellent specimens of Hydnoceras found by the Donald, Randy, and Jean Rinehart Family. We thank them for the loan of these specimens so that they might be studied by paleontologists and enjoyed by visitors to the museum.